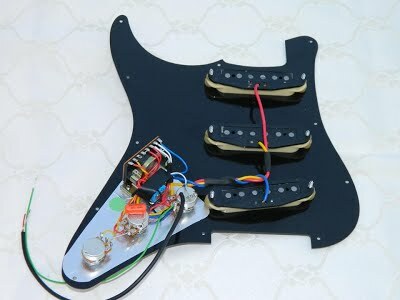 This is Ironstone Custom’s hand-built version of the Gilmour Scratchplate Pickguard as used on his famous ‘Black Strat’. 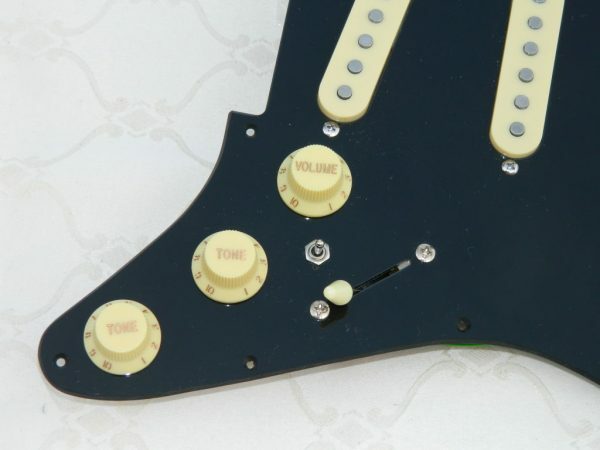 Not only does it feature the famous ‘Gilmour mod’ (neck and bridge pickups in parallel) , but on this unique design the same 3 way miniature toggle switch also operates a ‘Bridge in Series’ pickup configuration to really boost your tonal range. 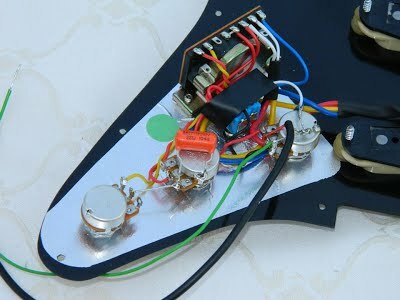 This allows for a tonally fat and very convincing quasi bridge and neck humbucker to be available from normal single coil pickups. The photos are of representative assemblies, there may be variations in wiring colour etc. The plates are supplied fully built and tested with protective foil in place. All of the clever switching happens on the plate itself, leaving just a simple 2 wire connection for you to make. Please note this is a 11 screw hole plate, and due to variations between guitars, some body hole re-alignment may be required. Given the number of combinations available, we stock a small number of part built plates, for completion to a customers specific requirements. Completed and fully tested Gilmour Scratchplate Pickguard assemblies are normally despatched within one working week of payment. These assemblies are only available through this website. Please leave a note on the order, or send us a message to confirm your colour choices when placing an order (Contact Us) for a Gilmour Scratchplate Pickguard. New for 2018! Scratchplate now available with ‘Bridge Blend’ option as well as the Gilmour Neck in parallel functionality (at no extra cost). Please check out the switching details and chart on the Gilmour Scratchplate Wiring page, or contact us via the contact page for more details. Please note: The price above is the UK total price including Royal Mail First Class Recorded postage. Non UK customers will be advised of an additional postal charge (International Tracked / Signed) during the checkout process before final payment (see Shop page for current charges). Having built more than a dozen ‘Black Strat’ tribute guitars, customers started to ask for complete Gilmour Scratchplate Pickguard assemblies. 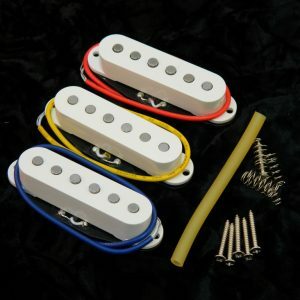 This is now available uniquely through Ironstone Custom, allowing you to complete the majority of the guitar to your own preferences, then just drop in (a simple 3 wire connection) a professionally hand wired and fully tested scratchplate assembly. Check out the sound clip / videos below as well as the build options tab. Thanks to Mick Ryan for his sound clips of a Platinum based scratchplate playing a medley of well known Floyd pieces. Recorded direct to pc via a Boss Gx700 effects unit. As a demonstration of the ‘bridge in series’ switching capability of these Gilmour plates, have a listen to this high gain tone video (bridge and middle in series). Finally, thanks to Ian Gorse for a YouTube ‘Pink Floyd medley’ using an Ironstone Gilmour scratchplate (with upgraded platinum pickup set) on a ’91 Squier Strat. Below the video is an MP3 of the Time solo from the video recorded using a Line 6 Pod XT. The Ironstone Gilmour scratchplates are available with a number of options, allowing you to ‘build’ your perfect plate. 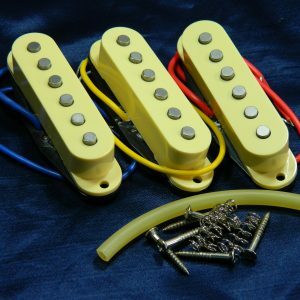 All of the Ironstone Strat pickups can be ordered as the basis of your plate – Silver, Gold, Platinum, Hybrid and Origin. The choice of pickups determines the price for the completed plate. Two options are standardly available, all Black (3 ply thickness), or White (WBW 3 ply). Alternative, given the huge selection of scratchplates available, Ironstone are happy to complete a build on a customer supplied plate (customer to cover delivery cost to Ironstone). Please contact us before ordering to arrange this. White, Black, Cream (aged white). Any queries regarding these options, or any other aspect of the scratchplates, please just contact Ironstone through the Contact Us page. The guitar is a 1985/6 Jap built Strat. It’s previous owner had done unspeakable things to it. After tearing it down, I realised the body was clean, virtually scratch free and all of the body mods made to accommodate a weird pickup, would be covered by the scratchplate. In the past I’ve used Ironstone pickups as first choice – let’s face it they’re pretty damn fine! So I ordered the ‘top of the shop’ version of the Gilmour modded plate. Simple to fit, and within a hour of receiving it I was being amazed, and loving the sheer flexibility, from fingerpicked clean, to overdriven down and dirty. Tried out now on amp modelled Cube 80, hot valves with my Marshall JCM 900, and Orange Tiny Terror, and Rockerverb 50, also my THR10 practice amp. It does the job, fantastically well – in fact, I’m in need of getting into the studio with it now to use a bit of volume! is now astounding, I’m very busy exploring all the new sounds and possibilities that I have in combination with my Amp. A big thank You to Tony and all involved in the in the high quality of the product and the top service in sorting out a postal problem. I put the Gilmour scratchguard (Platinum pickups) into a 2002 Squier Standard Strat. First of all, the scratchplate assembly was absolutely immaculate and arrived in less than a week – Tony’s communication throughout has been first class and gave me confidence to choose the Platinums. A genuine pleasure to deal with. The important bit though, is that I’ve now got a Strat that sounds ‘proper’ and gives amazing versatility – not just the extra switching options but the responsiveness of the pickups. Having a guitar you don’t have nagging doubts about is a huge boost to confidence in playing – the only trouble is, the frets are already well-used and given that I haven’t picked up another guitar since getting the scratchplate a couple of weeks ago I’ll probably need a new neck in a year’s time! I can’t claim to be a great guitarist, but the difference this has made to the sound is very, very obvious and in the best possible way. I suspect that I’ll be back for more from Ironstone at some point in the future. Many Thanks Nick. Ease of installation is a big part of these plates. I aim to deliver the most tonal variety for the least amount of end-user installation effort! Shame I’m only coming back here now after about 2 years, been enjoying my strat so much! I started my ” black strat” project and searched for an easy solution to the pups and associated wiring loom etc, you can imagine how excited I was when I found Tony ! I’ve actually documented the build, which other readers may find useful, you can find it here. http://www.welcometomywebspace.com/theblackstrat/index.htm So why am I posting now? After all this time? Well I’ve sold my “black strat” and have just acquired a Squier Vintage Modern 70s black strat and while the fitted Seymour Duncan’s sound good….they aren’t as good as Tony’s , so it looks like I’ll be back for another complete gilmour set up from Tony. 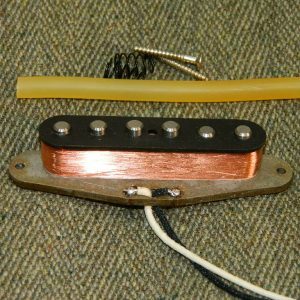 I had purchased some Ironstone pickups a couple of years ago for a strat and was very impressed with the sound from them. 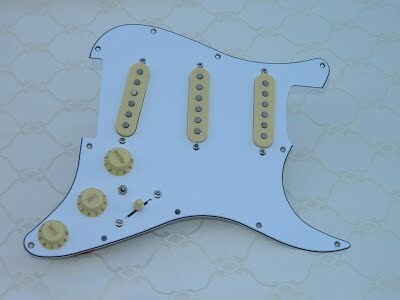 This project was to upgrade a Squier Standard Strat. After a brief conversation with Tony to sanity check my plans I decided to go ahead and order the Gilmore scratchplate with Hybrid pickups. It arrived a few days early and when I opened the boxed it looked amazing. Tony is an electrician by trade and his soldering work is second to none. 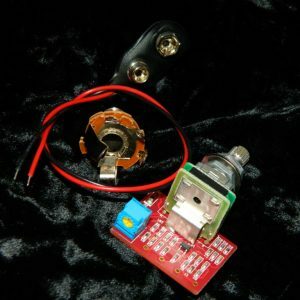 I was very pleased that I had decided to order the scratchplate and leave all the soldering to him. I fitted the plate to the guitar the following weekend. The sound is just as amazing as the build quality of the plate. I can get all those distinct “Pink Floyd” strat sounds that I had grown up hearing and have been so heavily influenced by. I would certainly recommend this to anyone who wants to supercharge a stratocaster. “Thought I’d send you an update.The gear arrived on time, thanks.My local dealer installed it last week and it sounds fantastic,in fact the guy who installed it wanted to keep it..!! I’ve used it at home on a practice amp and can’t wait to try it out properly. I’m still trying to work out the various pick up configurations, even whilst looking at your helpful diagram.I guess it would be more useful to just use my ears! I couldn’t be more pleased with the results of your efforts on this, it has changed the sound of my Strat beyond recognition. “The scratchplate arrived yesterday and it was very well packed. Fitted it last night and had a quick play on it. I am very impressed with the sound (Ironstone note; Gold pickups), very clear, very clean just what I wanted and perfect for Shadows music. 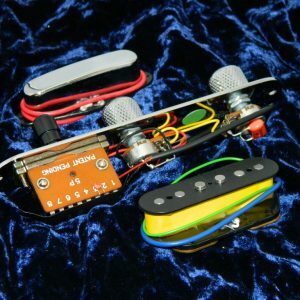 I also like the other pickup combinations lots of choice great sounds. 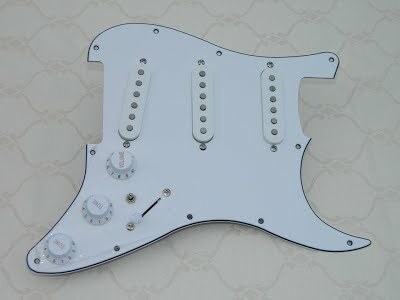 It has breathed new life into my strat – its like having a new guitar. 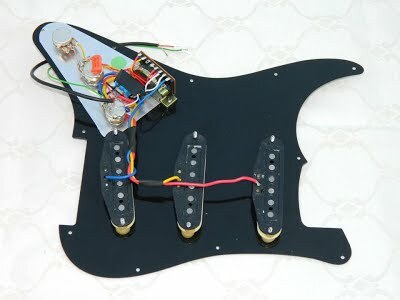 “the black strat is now finished . . I have gigged it a couple of times. I must say the improvement in clarity, tone, overdrive and feel is amazing . . back the vol pot off a touch . . Hank Marvin ! wind the vol pot right up . . SRV ! 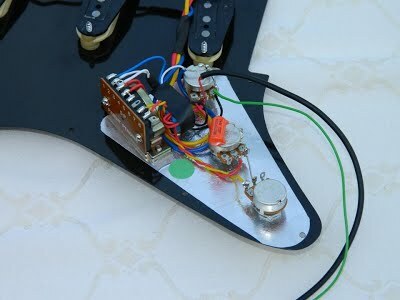 brilliant . . thats just the strat wiring too . . .
As I thought, in the humbucker mode, amazing deep south, jangly, screamy . . . scary to be honest ! Brill with Freebird solo. I’m totally impressed and will be using Ironstone for future projects . ..”. Looks and sounds perfect. 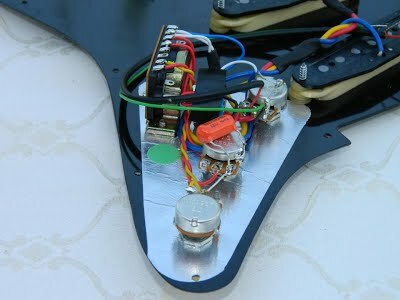 Gilmour tone out of the box. Thank you! Excellent communication, fast delivery and well packed ! Perfect Product, perfect service & communication, wunderbar!!!! Awesome Seller – looks amazing!!! And talk about quick delivery!! !